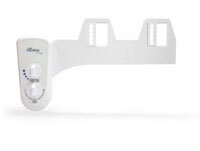 Bio Bidet Elite 3 Natural Water Bidet requires no battery or electricity. Comes with user-controlled stream of water feature and water pressure control, nozzle selection with nozzle self-cleaning functions. With convenient NEW dual nozzle system allows user to choose water stream. Softer mist action water stream for feminine use and satisfying efficient water stream for posterior wash.
Upgraded product and parts materials for better durability. **This is a great alternative for customers who desire the dual nozzles but have no need for warm water. The non-electric Elite3 is cold water only with posterior and feminine wash settings. Simple and Easy operation and installation. - nozzle can be easily replaced by user just by sliding it out of brackets for better personal hygiene. -new pressure control with variable stepping knob. Stepping control knob allows easier pressure control. 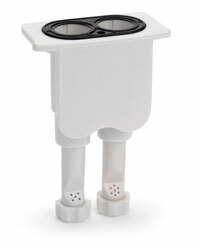 -Bottom body panel is added to better protect tubing from wear and tear and easy cleaning. Select nozzle clean feature and open pressure valve to clean the nozzle. Do not use excessive water pressure. When finished, gently remove excessive water in tapping motion using toilet paper. Select nozzle clean feature and open pressure valve for nozzle cleaning. Q. Does Elite3 requires electricity? A. No. It is non-electric bidet using strictly water pressure. Q. Does the Elite3 Bidet Supply Warm Water? A. No. It is natural water bidet and uses room temperature water. A. Elite3 is designed to fit most 2 piece toilets. However, some restrictions may apply to 1 piece toilets. Please consult our professional sales representatives if yours is a 1 piece toilet. Detailed fit chart can also be found HERE. Q. How do I determine my toilet type? A. Please follow this link for detail. Click HERE. A. Most orders are processed and shipped within 24 hours via UPS ground service.